PUMPS, ELEC GALLEY, ALL INSIDE PASSAGEWAYS. 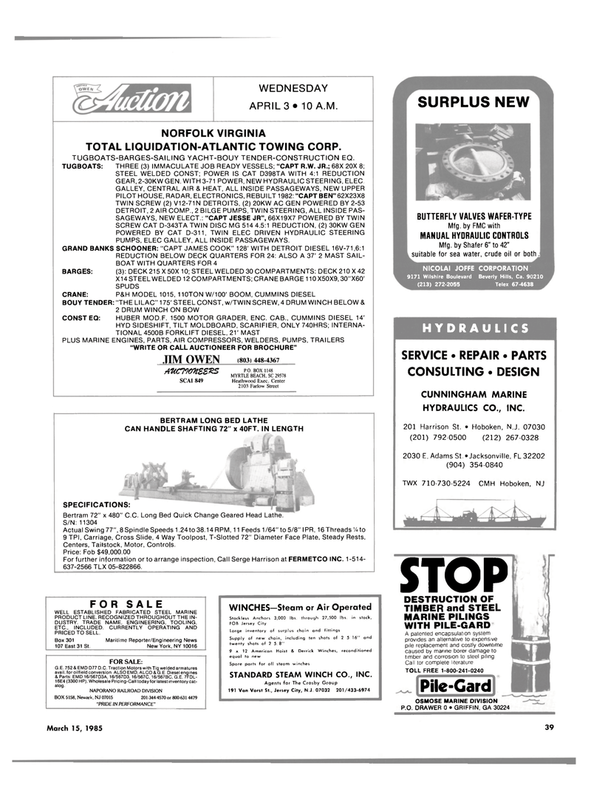 PLUS MARINE ENGINES, PARTS, AIR COMPRESSORS, WELDERS, PUMPS, TRAILERS "WRITE OR CALL AUCTIONEER FOR BROCHURE"
Mfg. by Shafer 6" to 42" suitable for sea water, crude oil or both. Box 301 107 East 31 St.
G.E. 752 & EMD D77 D.C. Traction Motors with Tig welded armatures avail, for oilfield conversion. ALSO EMD, ALCO & G.E. Diesel engines & Parts: EMD 16/567D3A, 16/567D3, 16/567C, 16/567BC, G.E. 7FDL- 16E4 (3300 HP). Wholesale Pricing-Call today for latest inventory cat- alog. BOX 5158, Newark, NJ 07015 201-344-4570 or 800-631 4479 "PRIDE IN PERFORMANCE"
A patented encapsulation system provides an alternative to expensive pile replacement and costly downtime caused by marine borer damage to timber and corrosion to steel piling. For further information or to arrange inspection, Call Serge Harrison at FERMETCO INC. 1-514- 637-2566 TLX 05-822866.